First, I picked up this beauty at the antiques fair on New Year’s Day. Living room vignette with vintage chair, painted chest, and new cushions. 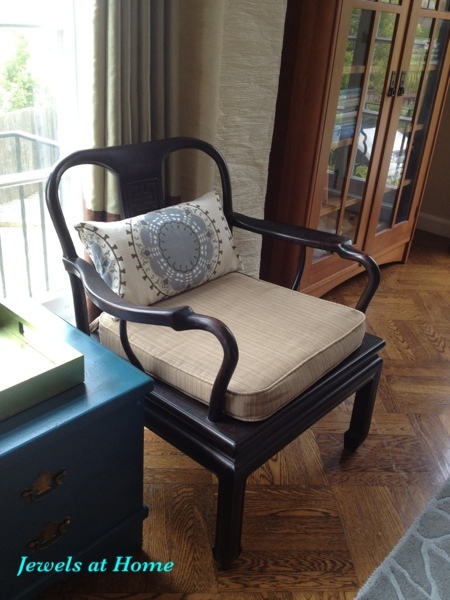 Free Queen Anne chairs found through Craigslist: from worn and boring to fresh and elegant! Another step in the evolution of our old Ikea chairs. This new fabric gives them an elegant yet whimsical feel that fits in with the Chinoiserie/ Regency look I am working on in our living-dining room. 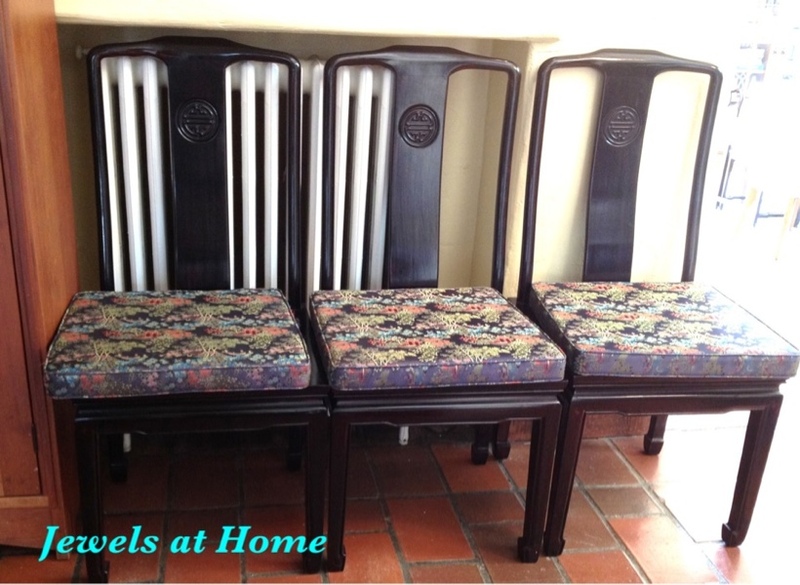 Along the way, I could not resist these traditional Chinese chairs, also a deal on Craigslist. Solid wood traditional Chinese chairs. Suddenly, I had too many chairs… and I still wanted a bench for our front hallway. Do you sense a solution here? I did! While you could certainly get clever with carpentry and join chairs together in a number of creative ways (side by side in a row; on either end with a board in between; with two chair backs turned 90 degrees to make the ends of the bench, etc..), I didn’t want to permanently alter these chairs, since they are well-made and beautiful and might move on to a new purpose some day. 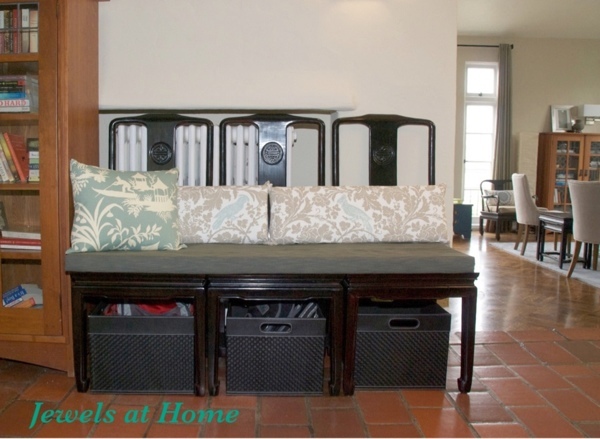 Instead, I chose to strap the chairs together and use cushions to give the feel of a single piece of furniture. To make the chairs work together as a bench, I started by strapping them together. 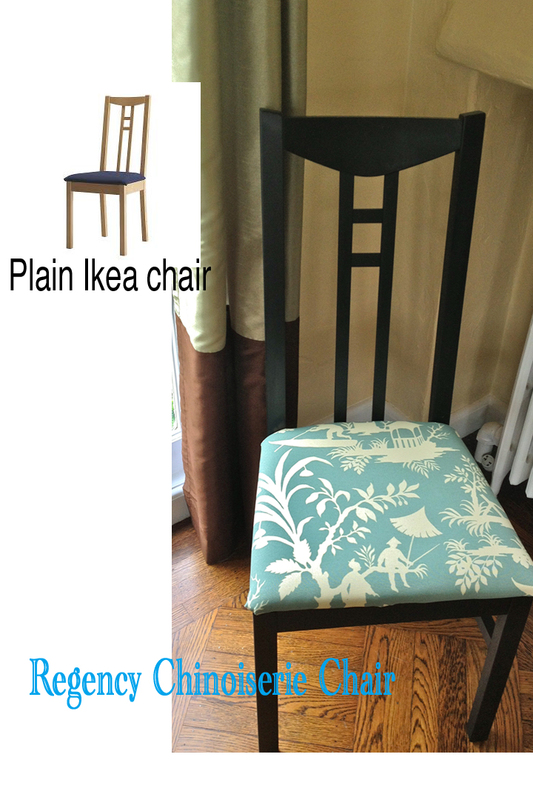 I used felt strips that were 2″ wide and long enough to wrap around two chair legs with 2″ overlap. I put straps at the back of the chairs, at the top and bottom of each leg. Measure the top and bottom of the legs separately, since they might not be the same width. 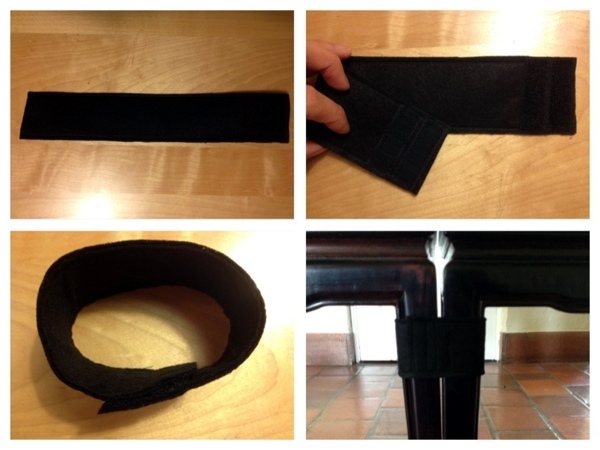 Sew straps to link chairs together into a bench. I took off the three separate chair cushions and added a single big one. After going around and around with all the options for fabric, I chose this textured fabric that has shades of blue, green, and grey in it. It ties together a lot of elements in the foyer and living room and doesn’t compete with the design of the chairs. I added two bolster cushions in this really fun print: Barber in powder blue by Premier Prints. The technique for making the bolsters was detailed in the tutorial on sewing pillows. I used two, rather than three, to take attention away from the three separate chairs. I’m thinking of ways to use some more of this fabric on the living room that is right off the foyer. 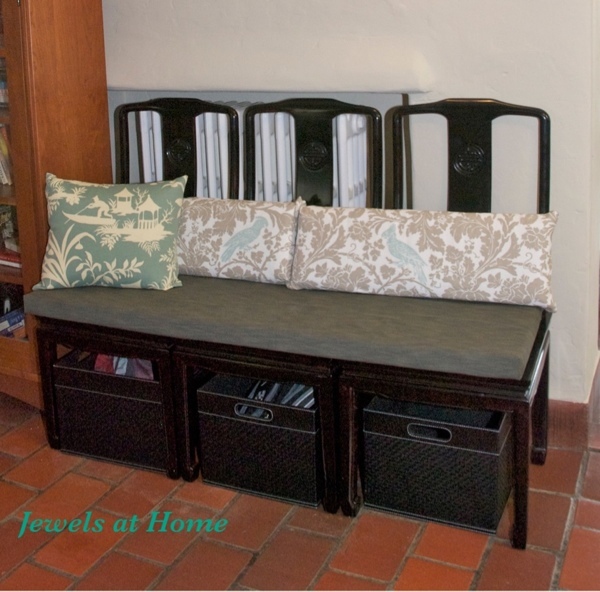 Finally, I tucked these faux leather storage crates under the chairs for the boys to keep their school bags and library books, so these things don’t get lost. 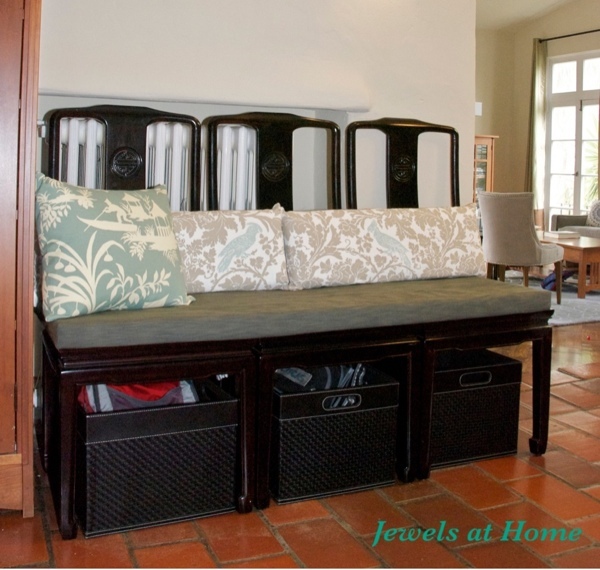 Our new entry bench and storage system is working very well, and I like how it looks, too. such a great idea for a bench, i may have to borrow it. silly question, maybe, but what kind of sandpaper do you use before painting the chairs? a fine one? i’m so inspired! Thanks, and by all means, go ahead and try it! If you do it this way, you don’t have to alter the chairs permanently. 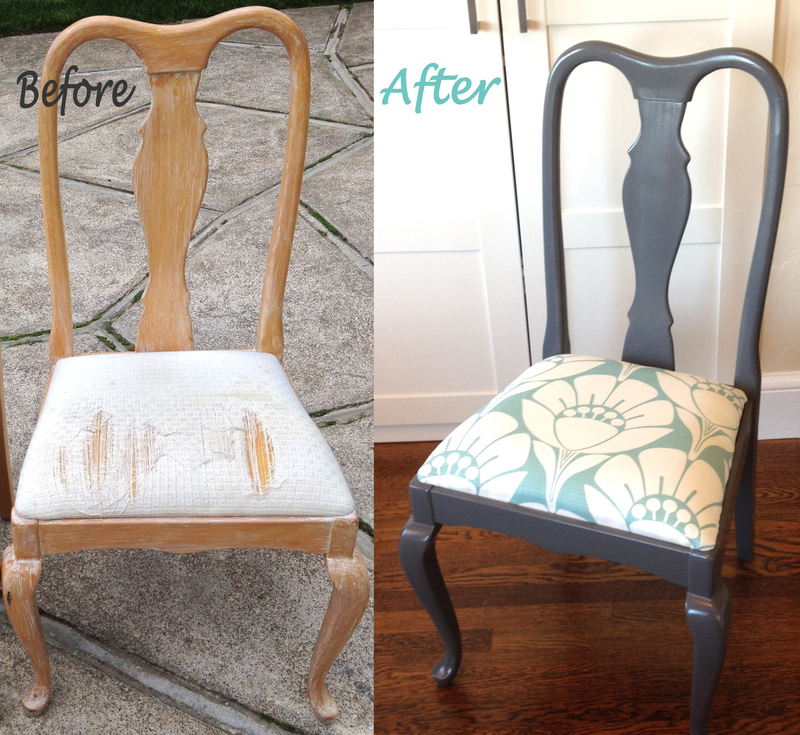 This project only happened, because I am chair-crazy, but I’m happy with how it turned out. I didn’t paint these chairs, but on the other painted chair projects, I used a fine sandpaper (150 or 220 grit), which seems to be enough to roughen up the surface without making it feel bumpy or gouged. Good luck! Wow, what a great idea. Love the way you lined up the birds in the pillows too.